Whether you’re enjoying a glass or two at the end of a long day, sharing some bottles with your mates, or enjoying a great vino with your partner, ensuring your wine is at the right temperature really can make all the difference. This is especially true when drinking outside in the sunshine - the blazing heat of summer might be passing, but we reckon there are still plenty of warm days to come. Nothing kills the mood like a lukewarm bottle of white wine when you’re hankering for something chilled, crisp, and refreshing… and that’s where wine coolers and chillers really come into their own. Sure, there are loads of bog-standard wine coolers and ice bags out there on the market. But we know that our readers like things a little special, a little out of the ordinary, and which show off their impeccable sense of taste… after all, isn’t that what The Wine Gallery is all about? Well, we’ve done the hard work scouring the shops and online stores of Australia, and we’ve come up with five wine coolers that don’t just keep your whites nice and chilled, they also look damn cool, too. This French Kitchen Marble Wine Cooler really has that special something that makes wine drinking into the classy event it deserves to be. 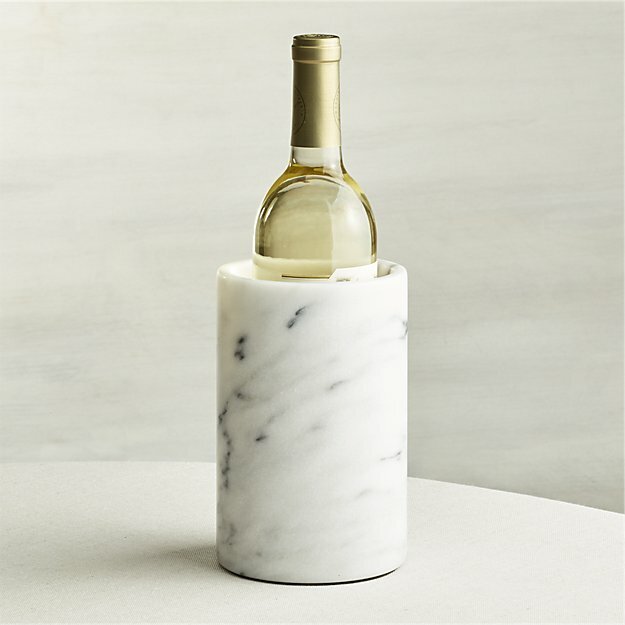 Made from quality marble, it brings a touch of classical flair to your dinner table… and its style is definitely matched by some serious substance, as the cool natural marble will keep your bottles at the perfect temperature for optimal enjoyment. What’s more, the neutral white and grey colours look fantastic with almost any decor, and when you’re not cracking open a bottle of wine (it has to happen sometimes, right?) it could double as a gorgeous vase for a bunch of flowers, too. If you’re anything like us, you’ve got a bit of a reputation for clumsiness (especially once the first bottle has been polished off, right?). The last thing you want when you’re out in the garden with your mates is to drop your wine cooler, or stumble over it while playing frisbee… and that’s why this Serroni Fresco ‘unbreakable’ wine cooler is proving to be a bit of a hit with Aussie wine fans. This large size wine gondola is made from clear polycarbonate, so it really looks the part while being tough enough not to worry about when you’re drinking outside. We’re always a bit sceptical about any product labeled as ‘unbreakable’... but even the most haphazard of you will struggle to end up cracking or smashing this useful bit of kit! 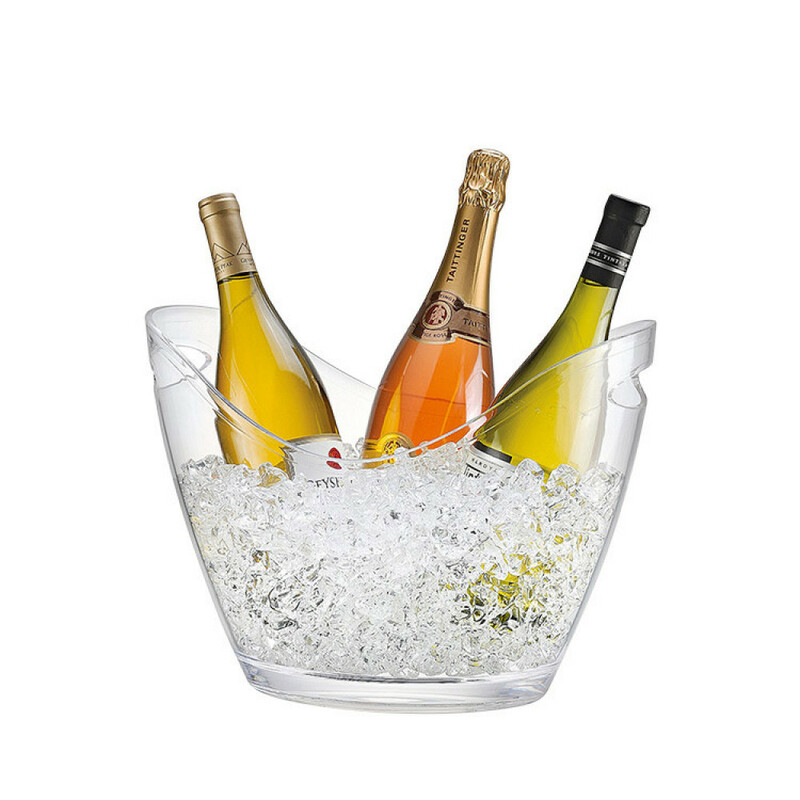 It’s impossible not to get excited when faced by a Champagne bowl, overflowing with fresh ice, and with a few bottles of something delicious fizzy sticking out of the top. 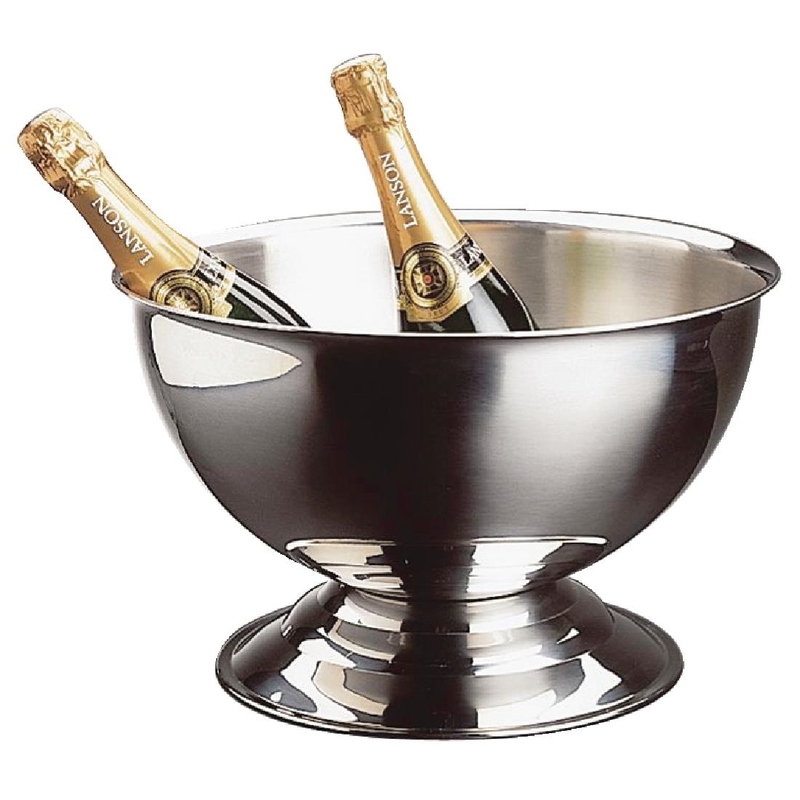 We absolutely love the classic, romantic design of this APS Stainless Steel Champagne Bowl - it’s a really well made, elegant and sophisticated item that’s sure to up your dating game by a considerable margin. With its stunning curves and timeless class, it’s ideal for romantic nights in and celebrations alike, and thanks to the high quality materials it’s made of, you don’t have to worry about it tarnishing and dampening your style. Nice! Like your dinner parties and soirees to be as sleek and sophisticated as you are? 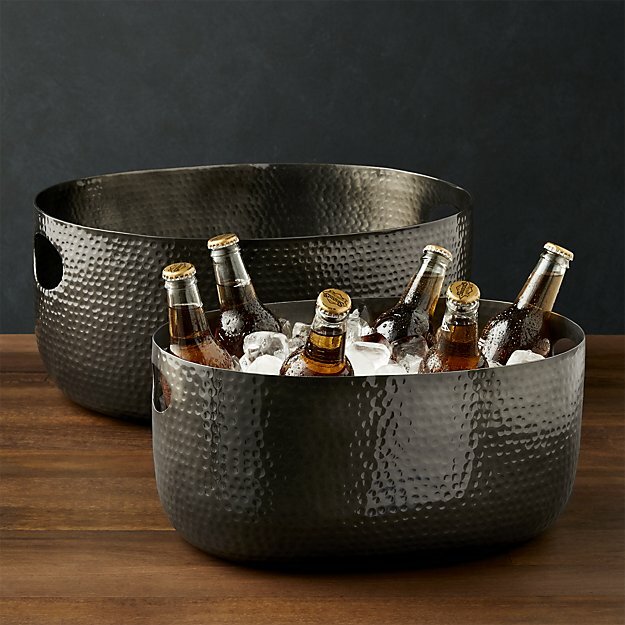 If so, you won’t be able to resist this Bash Graphite Beverage Tub from Crate&Barrel. These gorgeous pieces of wine kit really offer some welcome respite from the ordinary, clunky metal buckets we’re all used to seeing - they’re a real work of art, and manage to walk that fine line between the rustic, the artisanal, and the effortlessly cool. With plenty of space to pack in a fair few bottles of white wine or fizz, this aluminium drinks tub is sure to raise a few appreciative eyebrows at your next gathering. The graphic finish is a nice contemporary touch, too - perfect for those who like their drinking accessories to be bang up to date, and a little different from the everyday. You don’t have to be a tourist to see the value of getting one of these beautifully designed Aboriginal artwork wine coolers. There are plenty of different options out there - each showcasing the work of different female Aboriginal painters - but this one in particular caught our eye, as the patterned motif manages to look both modern and ancient at the same time. Boasting a pattern painted by renowned indigenous artist Queenie Lion Kamarre, this neoprene wine cooler is sure to make a big impact wherever you take it. Vibrant yet elegant, eye-catching yet understated, it’s ideal for those who love to expressive their artistic eye alongside their favourite tipple.